Sharing the music and videos with friends is really amazing, but better it would be if the gadgets would charge from renewable energy like solar powered electric energy or keep the Go Green rules followed. At the moment, the market is offering us eco-friendly speakers which are more like acoustic docks which boost the audio source and they can be charged with renewable energy sources. Their experience is not satisfactory however, and to deal with this problem, Chin Yang and Balance Wu have developed Pulpop MP3 speaker that has been made from recycled material and will work on vibration speaker technology for audio amplifying through the surface that supporting it and a hollow space which is beneath the doughnut design. 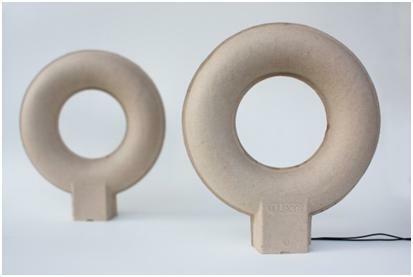 Assumption that sound cannot travel well through a paper and countering this limitation, these doughnut shaped speakers have been provided with area of surface being large to allow the greatest resonance possible of vibration and which should travel with 360 degree. The speaker hallow ring is made from pulp paper and molded with at highest possible temperature and pressure. Paper density, temperature control, and even the craftsmanship of those involved in the manual side of each unit’s creation can all have an influence on the finished piece. Something that’s not mentioned in the specs but is an obvious bonus is that the outer shell will also be biodegradable, although the small amount of internal electronics will need to strip out before disposal. Sounds from the digital music player are fed into the electronics via Plop’s 3.5mm input jack, after which it’s said to provide mono output of up to 5-watts RMS. The included 3.7V/600mA rechargeable battery is juiced up via an included USB charging port, although there’s no mention of charging times or how long you’ll be able to use Pulpop before needing to seek out some power. Eco friendly pulp fashioned into doughnut is an attractive and unusual green audio sharing solution but with dimensions of 10.2 x 11.6 x 2.4-inches (259 x 294 x 60 mm), portability could be a problem – particularly as you’re not really going to want to take the risk of damaging/denting the paper doughnut by stuffing the speaker into your backpack. Pulpop is priced at US$56, which is a best deal and cheaper than the latest version of the Sound Bug, although the latter does offer Bluetooth wireless connectivity and both left and right channel speakers.